For decades, "reading, writing, and 'rithmetic" were considered the most fundamental subjects in American K-12 schools. These days, in order to boost our nation's global competitiveness, many schools and colleges are emphasizing STEM subjects—Science, Technology, Engineering, and Math—over the liberal and fine arts. The White House has even announced the goal of increasing by one million the number of students who receive undergraduate degrees in STEM subjects over the next decade. In light of our shifting educational priorities and, in many places, shrinking school budgets, are there still persuasive arguments to be made for the importance of visual arts as a core school subject for American kids? Absolutely, says Christine Marmé Thompson, Penn State professor of art education. "Eliminating the arts from the curriculum is short-sighted on a number of levels," she says. "Seeing art as expendable indicates a deep misunderstanding of the role it plays at the center of learning. The visual arts are a powerful language for communicating concepts and theories in any field, both during the process of being developed and once they are finished 'products' to be shared with others." Because works of art are almost always 'about' something, she adds, they can be the glue that binds the curriculum together and helps kids synthesize all of their learning throughout the day. Many educators recognize that creating this kind of synergy between subjects helps students learn in a deeper and more well-rounded way. Thompson says this is why there's a growing movement to turn STEM into STEAM—Science, Technology, Engineering, Art, and Math. To be competitive globally, we need more than a grasp of factual information; we need to raise people "who can innovate in every field, including the technical ones," she adds. The liberal and fine arts, including visual arts, are recognized as playing an important role in the development of creative thinking skills. As Thomas Friedman, author of the bestselling book The World Is Flat, put it in a recent interview, "It's not that I don't think math and science are important. They still are. But more than ever our secret sauce comes from our ability to integrate art, science, music, and literature with the hard sciences. That's what produces an iPod revolution or a Google." "I couldn't agree more," says Thompson, one of only three art educators nationwide to be named a National Art Education Association Distinguished Fellow for 2015. "That's why I feel so strongly that schools without art education programs will narrow students' education and potential contributions to society." Art programs should be expanded, not put on the budgetary chopping blocks, she argues. "Overall, I think there is often less emphasis on making art in art classes today, for reasons that are often practical and financial, including lack of supplies and storage. There is great disparity in the ways that art is taught and provided for from one school to the next, much as there is tremendous difference in the ways that schools are funded and provisioned across the country, even from neighborhood to neighborhood. But whatever the circumstances, the work of dedicated art teachers is vital for some children, and significant for all." Thompson directs the highly regarded Penn State School of Visual Arts Art Education Program, a Saturday art program for students ages four through eighteen. Despite the program's success, she does not view such private efforts as a substitute for art classes in the schools. "I like to think that the relationship between art in the schools and our teaching in Saturday School is reciprocal," she says. "We hope to support art teachers and we know that we build on their work. We have great success because our students are amazing, and our students are amazing thanks, in part, to their in-school art teachers who have inspired and guided them." 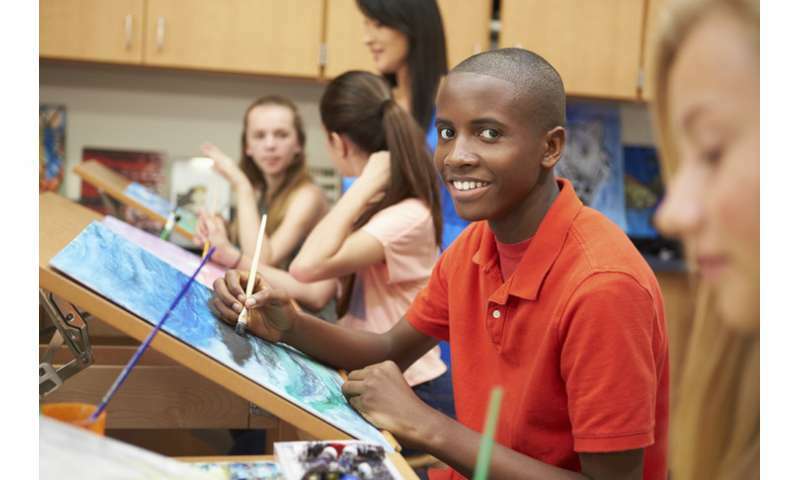 Private programs can, however, provide a vibrant example of "what can happen in and because of art education," she says—an example that may help persuade policy-makers and school boards of the importance of art in the schools. "We are at a critical moment, when decisions are being made against the best advice of people who have devoted their lives to understanding children, teaching, and learning," says Thompson. "I believe this is a time when we need to listen to children, to parents, and to teachers, and to realize that the things that make children happy and proud and confident matter a great deal, and belong in schools. Every child deserves to have diverse educational experiences, including in the arts, so they can determine what they love to do and who they hope to be. That is supposed to be how America works." Man bites dog. Penn State professor of art education and National Art Education Association Distinguished Fellow campaign to ban art from schools. Sorry, the above is so dog bite man story boring.